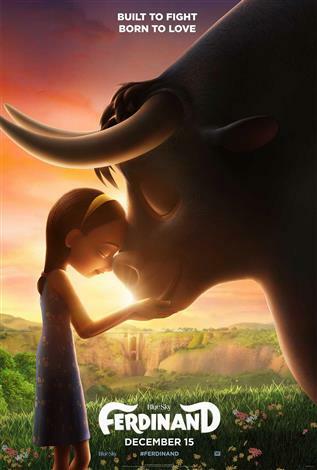 FERDINAND tells the story of a giant bull with a big heart. After being mistaken for a dangerous beast, he is captured and torn from his home. Determined to return to his family, he rallies a misfit team on the ultimate adventure. Set in Spain, Ferdinand proves you canat judge a bull by its cover. Kate McKinnon, Anthony Anderson, John Cena, Kate McKinnon, Gina Rodriguez, Daveed Diggs, Gabriel Iglesias, Bobby Cannavale, David Tennant, Anthony Anderson, Flula Borg, Sally Phillips, Boris Kodjoe, Jerrod Carmichael, Raúl Esparza, Karla Martínez, Miguel Ángel Silvestre, Jack Gore, Jet Jurgensmeyer, Nile Diaz, Colin H. Murphy, Jeremy Sisto, Carlos Saldanha, Luis Carlos de la Lombana, Adrian Gonzalez, Juanes, Julia Scarpa Saldanha, Lily Day, Jordi Caballero, Naz Homa, James Palumbo, Bernardo De Paula, Belita Moreno, Carlos Reig-Plaza, Jason Fricchione, John Gidcomb, Richard Gould, Andre Robinson Jr.